Kappan’s articles about learning have explored not just how students learn, but how researchers and educators can deepen their understanding of student learning. One could make the argument that the bulk of Kappan’s content over the past 100 volumes has explored what we’ve learned about learning. Article after article has considered strategies, programs, and policies that promote student learning. Even articles about educator development have addressed, at least implicitly, the kinds of teacher learning that are most effective at helping students learn. Some Kappan authors, though, have taken the discussion to another level, asking, in essence, how do we know what we know about learning? And when we make new discoveries about learning, how can we use them to inform teacher practice? A reliance on practical experience, Edel wrote, had predated the experimental model so prized by scientists, and it could once again become an important guide to knowledge. In February 1976, Raymond McKenna (“Piaget’s complaint — and mine: Why is there no science of education?”) used the writings of Jean Piaget as a springboard into the question of why there was no thriving science of education. Without a stable of researchers engaged in rigorous study of teaching and learning, teachers had to rely on government officials and administrators for guidance. The great ideas in the world of education, McKenna observed, came from people who were not actually trained teachers, such as John Dewey, Maria Montessori, and B.F. Skinner. Why, he asked, doesn’t the field raise experts from its own ranks? Echoing Sizer from four years earlier, he worried that the lack of research expertise among educators was also leading to a lack of rigor: “Adequate theory would explore the who-why-what-whether-where-how-when dimensions of teaching/learning, but today how-to-do-itry tyrannizes all other dimensions” (p. 407). Then again, maybe the way forward lay neither in basic scientific research nor the cultivation of practical wisdom but, rather, in a new focus on empirical studies. In February 1980, Benjamin Bloom (“The new direction in educational research: Alterable variables”) reported that educational researchers had achieved a “revolution” in the study of teaching and learning, thanks to an emphasis on direct observations in classrooms. Rather than trying to translate the findings of basic psychological research into teaching practices, researchers should take an empirical approach to instructional improvement, he argued. By observing what happens when schools alter certain variables — such as time on task, prior student knowledge, and teacher actions — they can identify what matters most to student learning. Of course, if educators want to understand learning, one obvious area of exploration is the brain. One of Kappan’s earliest articles about the brain, published in 1969, had the mouthful of a title “Psychoneurobiochemeducation.” In the article, David Krech, a professor of psychology at the University of California, Berkeley, considered what rat studies might teach about how the brain works and how those findings could inform education. He envisioned a world in which the expertise of biochemists, pharmacologists, neurologists, psychologists, and educators all come together to improve “the intellectual stature of man” (p. 375). And he was also among the first of several Kappan authors to predict (long before the development of drugs such as Ritalin) the rise of “smart pills” that can help students improve their attention and memory. A number of articles in the 1970s proposed ideas that would now strike readers as fanciful, if not bizarre. For example, brain-boosting ideas suggested by Kappan authors included the use of electrical stimulation and biofeedback (“Medical, biological, and chemical methods of shaping the mind” by Edward Sullivan, April 1972) and transpersonal psychology (“Transpersonal: The new educational psychology” by Thomas Bradford Roberts, November 1974), which promoted mystical experiences and altered states of mind. In March 1976 (“Cerebral symmetry: An urgent concern for education”), Max Reynolds argued that schools have focused too much on the linear functions of the left brain and neglected more imaginative right-brain thinking. But in a February 1978 article that jibes a bit better with contemporary research in the neurosciences, Leslie Hart (“The new brain concept of learning”) advocated the creation of “brain-compatible” schools. Such schools would not expect children’s brains to adapt to schools but would instead take into account what is known about children’s brains and adapt instruction accordingly — for instance, he explained, the brain doesn’t learn well under threat, each brain is unique, and young students learn by talking. For Willis, brain science has potential to influence schooling, but not without careful efforts to correct educators’ misinterpretations of findings that have continued to persist. And that brings us to the current issue, in which Tracey Tokuhama-Espinosa describes the predominance of neuromyths in the popular press as well as areas of strong consensus among scientists. As Kappan authors have made clear across the past 100 years, the road to knowledge is treacherous, with plenty of appealing but incorrect ideas pulling educators off track. But the quest to learn more about learning remains essential to the profession. Citation: Preston, T. (2018). 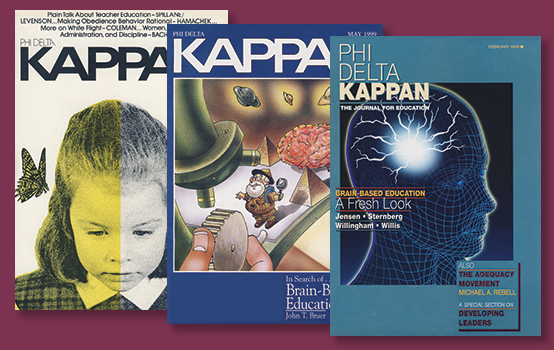 A look back: What Kappan readers have learned about learning. Phi Delta Kappan, 100 (4), 5-7.